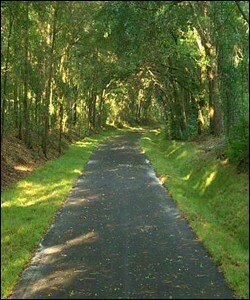 The Seminole Wekiva Trail is a paved recreational trail used for biking, roller blading, jogging, walking, and horseback riding. As part of the "Rails to Trails" project, the trail was built on the site of the old Orange Belt Railway, and currently runs 14 miles from Altamonte Springs, through the Markham Woods area of Longwood and Lake Mary, and ends at the Wekiva River west of Sanford. Most of the trail is shaded with a heavy canopy of trees, allowing users to use on hot, sunny days without getting sunburned. On the northern half, you're likely to encounter all sorts of wildlife, including deer, wild turkeys, hawks, bald eagles, sand hill cranes, and even black bears. There are tunnels underneath major crossroads, including Lake Mary Blvd. at Heathrow and State Road 434 in Longwood.